DRF specializes in backflow device installation, repair, and maintenance for commercial and multi-family properties. Let our team of licensed CCCDI technicians help you. Commercial and multi-family properties typically need a backflow prevention device to ensure a clean water supply. 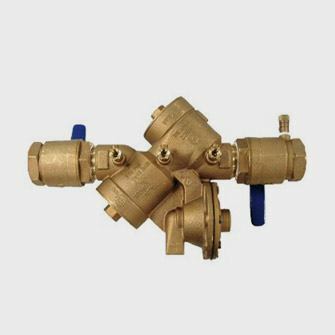 Municipal codes often require a backflow prevention device at each cross-connection point found within your commercial plumbing system. The plumbing systems that often require a backflow prevention device are hospitals, apartments, condominiums, any food serving establishments and/or commercial establishments/buildings. A backflow prevention device protects potable water supplies from contamination or pollution due to backflow. In water supply systems, water is normally maintained at a significant pressure to enable water to flow from the tap, shower, or other fixture. In order to protect your customers, tenants and yourself from backflow issues, DRF has fully licensed plumbers and Cross-Connection Control Device Inspectors (CCCDI) to ensure your backflow is tested properly. When it comes to your commercial building, DRF’s fully licensed plumbers and Cross-Connection Control Device Inspectors have the necessary knowledge and skill to provide backflow testing on a wide array of Reduced Pressure Zone (RPZ) systems.